If you do a lot of business out of your car – you can easily slide the bags over the passenger seat headrest, keeping all your important gear from flying around and easy to access. These unique executive saddle bags will show your cowboy style. Simple and elegant the over sized saddle bags are a functional alternative to cumbersome briefcases. Load these custom saddle bags with all your business gear; throw them over your shoulder and walk a city block or two. You’ll never go back to carrying a briefcase. The heavy executive saddle bags can easily hold most anything, including your lap top, legal size folders, binders, note books, and cables. Inside you will find sleeves to hold your wallet, pens, or even a memory stick. We’ve even put a cell phone sleeve on the outside neck, and a heavy duty handle for ease of handling. Black, Saddle Tan, Antique Brown, Deadwood Brown and Old Mahogany. Will find these oversized saddle bags just the thing to carry all your cowboy action tools. 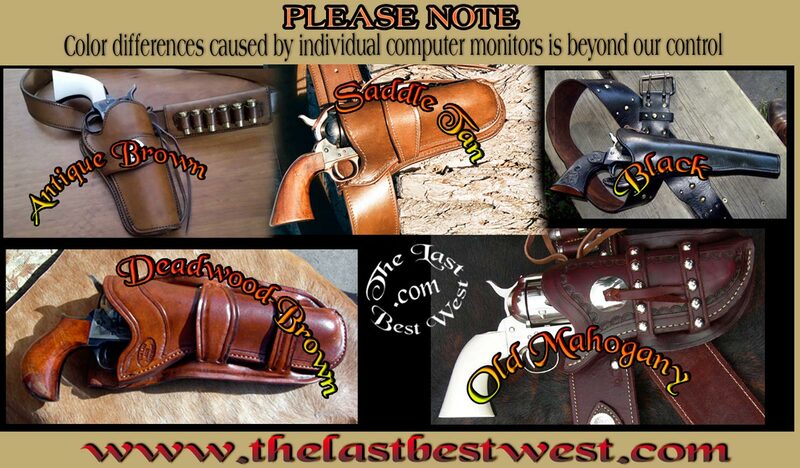 You can easily store a gunbelt; two holsters; spurs, wild rags and ammo. And that’s just in one side. On the other side you can carry a two pistol case and more ammo, and in most cases when the flaps are locked the bags are legal for firearm transport. The roomy interior easily holds your lap top, cables, wallet, pens, with plenty of room to spare. And having 2 bags doubles your carrying ability. Large clip boards, binders, receipt books all easily fit within the oversized design. Small locks (NOT included) will effectively secure the flaps if locking is important. Show here in Deadwood Brown with optional hair on hide flaps.